Bulk Order Redux is Now Closed – Thank You! 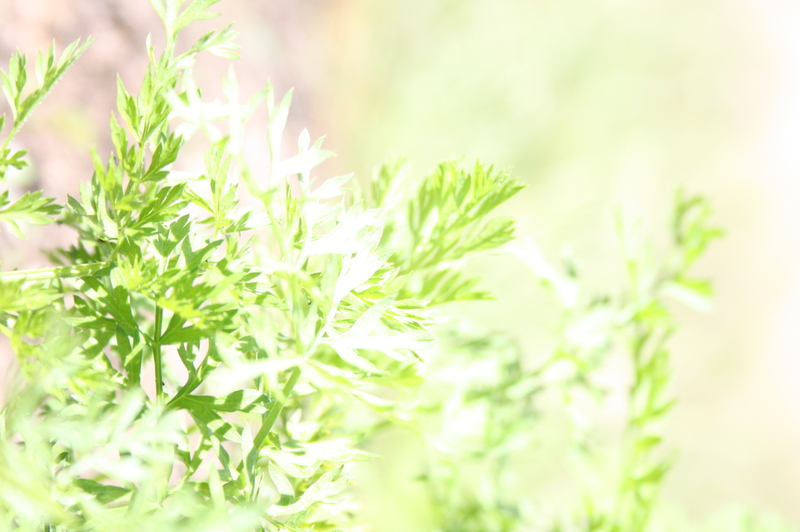 If you grow your own vegetables, snails and grasshoppers may be the last thing you want to see. But the fact is, these critters are resilient, and though I loathe them, I do reserve a modicum of admiration for their ability to hang on. 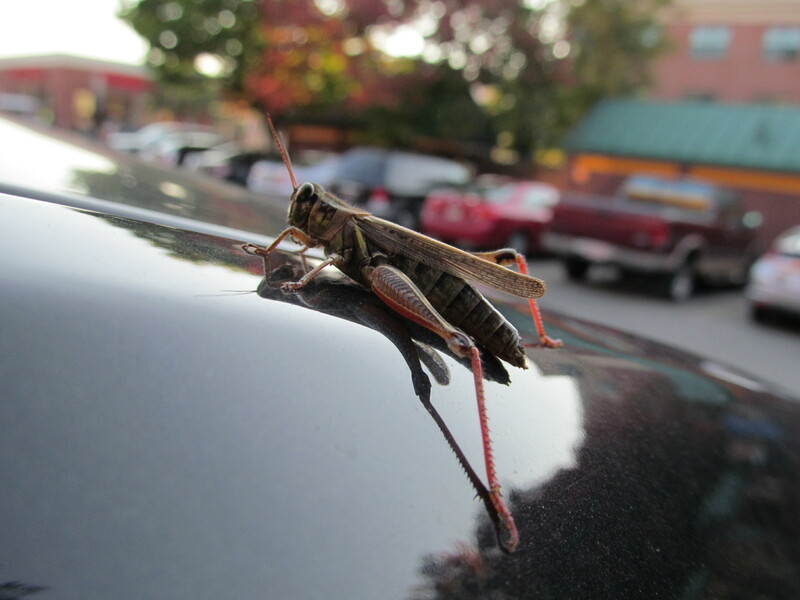 This grasshopper, for example, literally hung on to my car for the two mile plus ride from our house to downtown Salem. 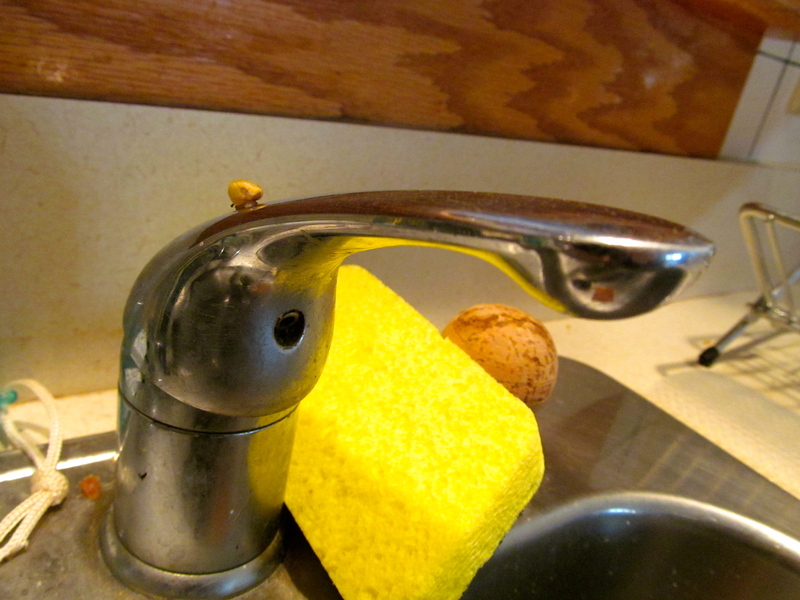 And see that tiny speck on the faucet? I washed this guy off my chard the night before and assumed he’d gone down the drain to perish in the jaws of the disposal. 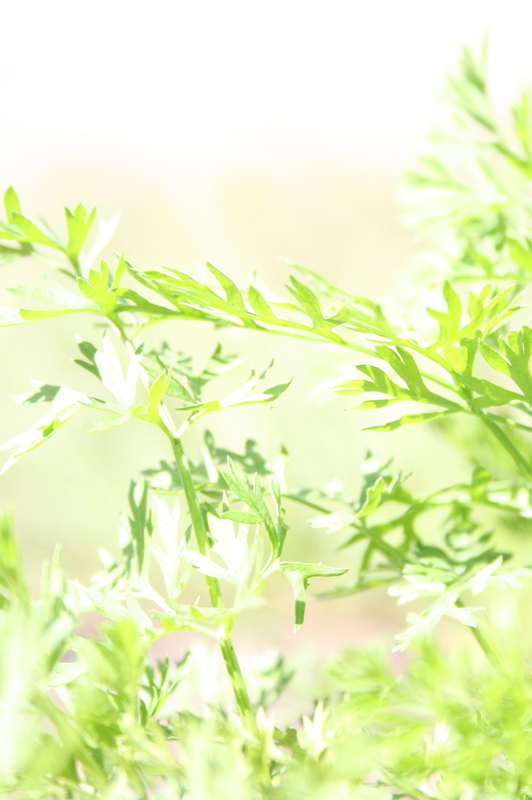 And no, it didn’t bother me a bit, because besides the groundhog that continually eats the tops off all my carrots and is in a class of villains all his own, the snails are garden enemy number one. 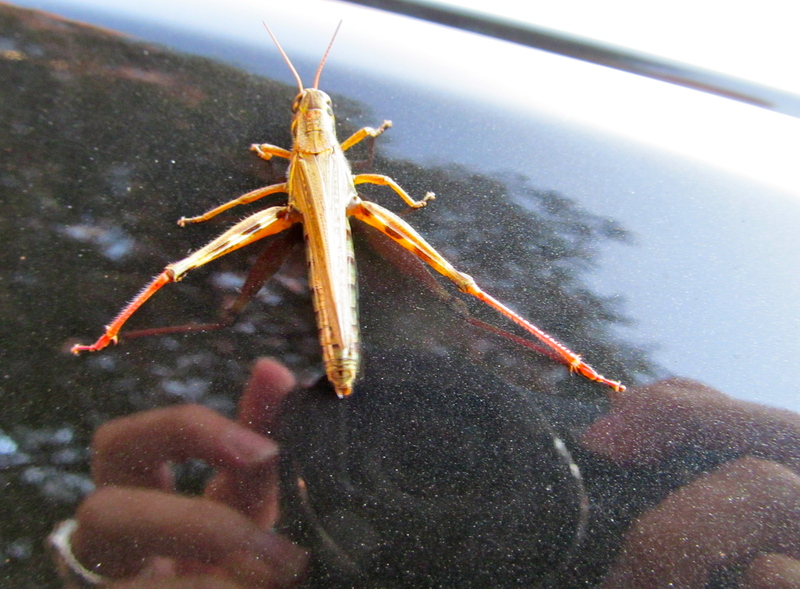 I found this one on the chard, remember? 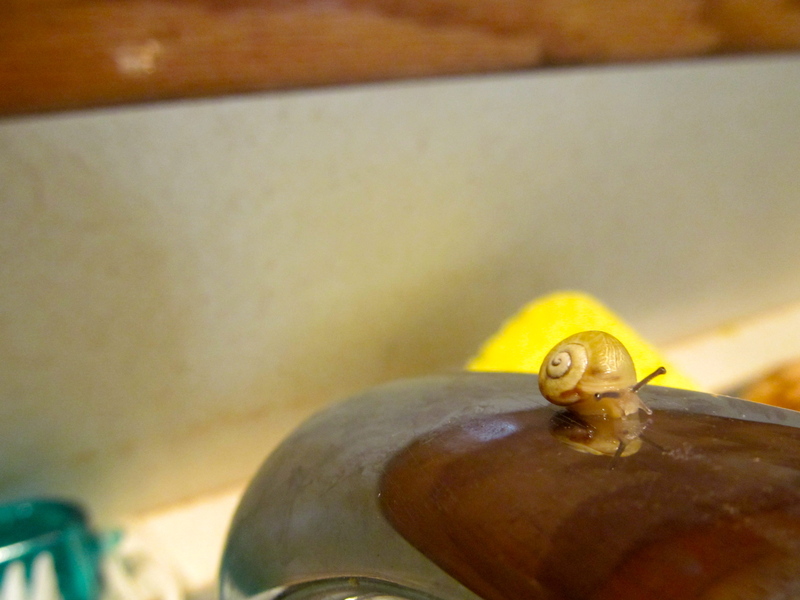 I woke the next morning to discover this miniature mollusk as whole as ever. Surprised and impressed, I transferred him outside to the grass and asked him to remember my charity and please eat from my neighbors’ gardens instead of my own. It’s the final week of the regular season and we’ve got a few more crockpot concoctions for you. These meaty meal ideas are more recollections of things we’ve recently thrown in our crockpots to cook than they are actual recipes. That’s usually the way I cook with crockpot anyway. I start with whatever meat or veggie I have a lot of and go from there, adding a dash of this and a squirt of that until the pot is almost full. Then I turn it on and forget about it. 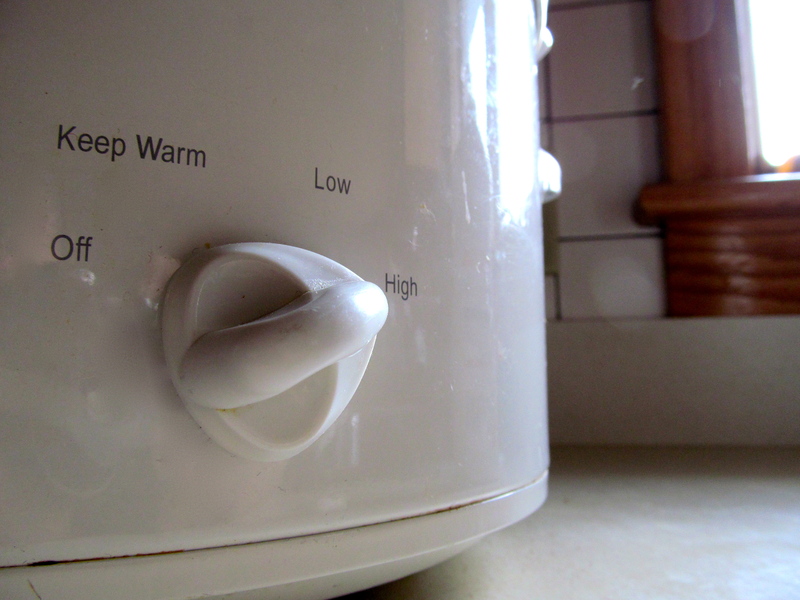 I’m usually putting my crockpot on before bed, so I often start it on high about an hour or so before I’m ready to turn in and then switch it over to low before hitting the hay. Our Operations Manager, Julie Pottier-Brown, made a slow-cooked dinner recently using ham hock from last year’s local pig, plus split green peas, a chopped onion, and some water. It all went into the crockpot and cooked on high for two hours (because the hock was frozen) and then for another six to seven more on low. She pulled out the ham, separated the meat, fat, and bones, shredded the meat and return it to the pot. Julie said that she, “stirred in my leftover collard greens from breakfast, and yum.” Although this whole meal sounds delicious, I was most impressed with the addition of the collards, not because of the greens themselves, but because they were left-over from breakfast! Way to eat your greens at every meal, Julie! If you’d rather chicken than pork, try my favorite way to slow-cook it: with peanut sauce! I throw about six frozen chicken breasts in the pot, followed by a few cloves of chopped garlic, about 1/3 – 1/2 cup of peanut butter, a can of coconut milk, a heaping tablespoon of miso, a squirt of Bragg’s, a few heart shakes of cayenne pepper, ground ginger (though I prefer fresh ginger if I have it) and a bit of whatever other hot pepper, fresh, powdered, ground or pickled, I have on hand. It only takes a few hours to cook. You’ll know it’s ready when you attempt to stir it and the chicken starts to fall apart. At this point, toss in whatever greens you have or prefer (I often use a tougher green like kale or collards, but have enjoyed it with chard as well), allow to cook until they are tender and serve over soba noodles or rice. 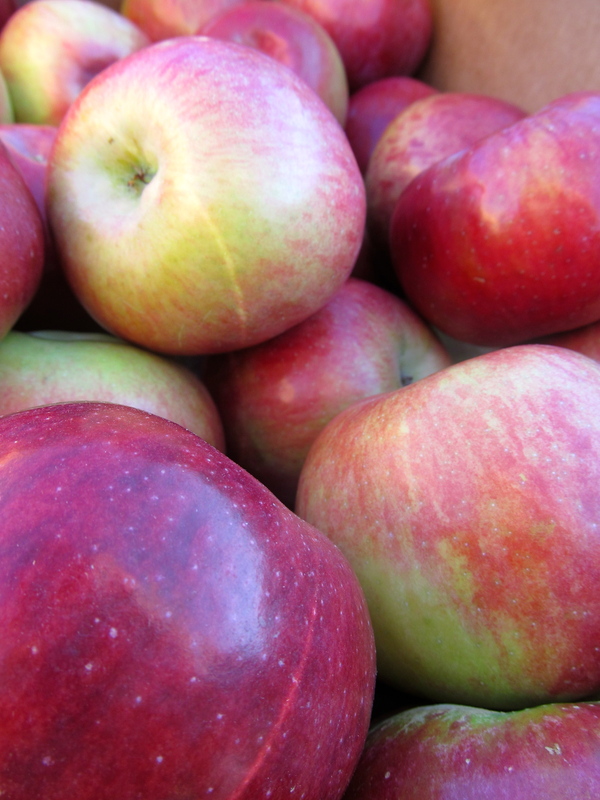 Stay tuned for my final crockpot post of the season later in the week, Slow-Cooked Dessert!